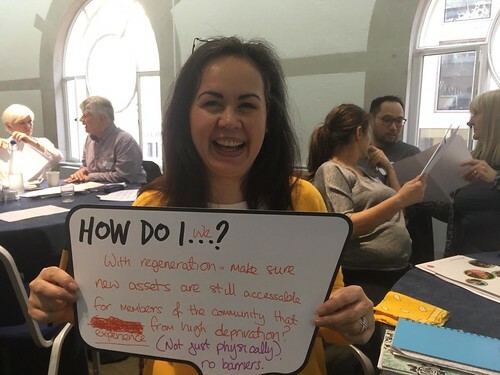 Published today, The Future for Communities: Perspectives on power shares findings from an 18 month research project asking ‘What needs to happen for communities to feel and be more powerful in the future?'. The report paints a picture of strong, resourceful communities affected by the challenges of poverty, transience and isolation; but also people and places where resilience and hope offer the prospect of positive transformation and change. In particular, it highlights the need for sustained investment in supporting community-level infrastructure – places to meet, organisations to bring people together and people to facilitate engagement. Isolation. Public spaces are shrinking. Where are the spaces where people can meet, talk and learn about each other? Will people increasingly retreat into their own homes and into virtual spaces? The research was commissioned by Local Trust, carried out by the Institute for Voluntary Action Research (IVAR), and funded by the Community Development Foundation (CDF) and the Joseph Rowntree Foundation (JRF). We are an independent research charity that works closely with organisations that are striving for social change. From the very small that directly support the most vulnerable in their local communities, to those that work nationally – across the voluntary, public and funding sectors. We use research to develop practical responses to the challenges faced and create opportunities for people to learn from our findings. We bring to the project over 17 years’ worth of research experience and a network of cross-sector, multi-disciplinary relationships. Local Trust was established in 2012 to deliver Big Local, a unique programme that puts residents across the country in control of decisions about their own lives and neighbourhoods. In 2016 CDF and the Joseph Rowntree Foundation provided Local Trust with funds for a major research project to explore Empowered Communities in the 2020s. Visit www.localtrust.knightstudiosdevelopment.com.